Wizard World, Inc. continues its 2015 schedule with its second visit to the Greater Richmond Convention Center at Wizard World Comic Con Richmond, July 31-August 2, 2015. Billy Dee Williams, Billy Boyd, Sean Astin, WWE Superstar Stardust and Diva Paige, Michael Cudlitz, Kristin Bauer, Drea de Matteo, and Henry Winkler headline the roster of celebrity guests scheduled to attend the pop culture extravaganza. Williams, Boyd, Astin, Cudlitz, Bauer and de Matteo will appear Saturday and Sunday, August 1-2; Stardust and Paige are scheduled for Saturday; Winker will attend all three days of the event. Other well-known Wizard World Comic Con Richmond guests include Taryn Manning, Joey Lauren Adams, John Schneider, Linda Blair, Eddie McClintock, J. August Richards, Jason David Frank, Doug Jones, and Milo Ventimiglia. Wizard World is also the home of the most creative comics artists and writers on the planet. Artist Alley at Wizard World Comic Con Richmond will feature Mike Grell, Billy Martin, Mike Zeck, Michael Golden, Ken Kelly, James O’Barr, Renee Witterstaetter, Clinton Hobart, Marv Wolfman, Danny Fingeroth and many others. In addition, all full-price Wizard World Comic Con Richmond attendees will receive a limited edition exclusive variant cover The Walking Dead comic, drawn by one of Wizard World’s talented artist guests (to be announced shortly). Comics will be issued at registration while supplies last and VIP attendees will receive an additional black & white sketch version. The Richmond show hours are Friday, July 31, 3-8 p.m.; Saturday, August 1, 10 a.m.-7 p.m.; Sunday, August 2, 11 a.m.-5 p.m.
Yeun will appear on Saturday and Sunday, Sept. 13-14; the WWE stars will attend on Saturday only; the others are scheduled for all three days. Other notables scheduled include Eliza Dushku, Giancarlo Esposito, Alan Tudyk, Michael Madsen, Ernie Hudson, Lou Ferrigno, Jason David Frank, Sara Underwood and the Boondock Saints duo of Sean Patrick Flanery and David Della Rocco. Superstar comics creators scheduled to attend include Eisner Award Hall of Famer Neal Adams, Ethan Van Sciver, Kevin Eastman, Kevin Maguire, John Tyler Christopher, Michael Golden, Arthur Suydam and Greg Horn. Wizard World Comic Con events bring together thousands of fans of all ages to celebrate the best in pop-fi, pop culture, movies, graphic novels, cosplay, comics, toys, video gaming, television, sci-fi, gaming, original art, collectibles, contests and more. Wizard World Richmond Comic Con show hours are Friday, Sept. 12, 3-8 p.m.; Saturday, Sept. 13, 10 a.m.-7 p.m., Sunday, Sept. 14, 11 a.m.-5 p.m.
A first-class lineup of topical programming takes place all three days at the event, with celebrity Q&A’s, the Wizard World Film Festival, comics-themed sessions, costume contest, movie screenings, evening parties and more. Sunday, Sept. 14, is also Kids Day, with an array of activities and programming specially designed for the younger Wizard World fans. Richmond Comic Con is also the place for cosplay, with fans young and old showing off their best costumes throughout the event. Fans dressed as every imaginable character – and some never before dreamed – will roam the convention floor, often stopping by the Show Stage, the ideal place to see and be seen. For more on the 2014 Wizard World Richmond Comic Con, visit . WWE Superstar Batista and WWE Hall of Famer ‘The Dragon’ Ricky Steamboat, will attend the inaugural Wizard World Richmond Comic Con on Saturday, September 13. Steamboat will sign autographs and pose for photo ops from 11 a.m.-2 p.m., while Batista will sign autographs and pose for photo ops from 2 p.m.- 5:15 p.m. followed by a Guardians of the Galaxy questions and answer session at 5:15 p.m.
Wizard World Richmond Comic Con is the third announced appearance by Batista on the Wizard World Tour. Batista (credited as Dave Bautista) is featured as “Drax” in the upcoming Marvel blockbuster Guardians of the Galaxy, which debuts in theaters just weeks before his Wizard World Richmond Comic Con appearance. 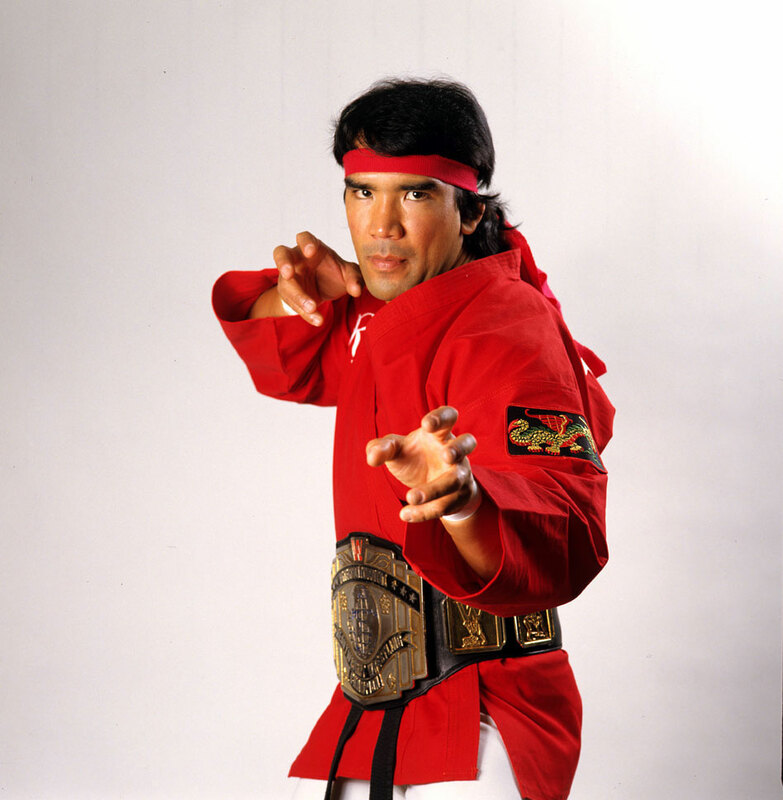 Wizard World Richmond Comic Con will mark the return of WWE Hall of Famer ‘The Dragon’ Ricky Steamboat to the Wizard World Tour after successful appearances at Wizard World Comic Cons in Philadelphia and Chicago in 2013. Steamboat spent much of his ring career in WWE where he was best known as The Dragon. Admired by WWE fans for his physical rivalries with the likes of Don Muraco and Jake “The Snake” Roberts, Steamboat’s greatest contribution to WWE history remains his WrestleMania III bout against Randy Savage. In front of a sold-out crowd of more than 93,000, The Dragon beat Macho Man to win the Intercontinental Title in a bout that was so technically sound and exciting it has been shortlisted on “Best of” lists ever since. Batista and Steamboat join such noted pop culture figures as Norman Reedus, Steven Yeun, Jon Bernthal and Michael Rooker of The Walking Dead, James Marsters, Manu Bennett, Adam West and Burt Ward, Alan Tudyk, Eliza Dushku,Michael Madsen and many more. Wizard World Richmond Comic Con is the 11th of 16 events scheduled in the 2014 series produced by Wizard World, Inc. and will also feature a top-drawer collection of well-known comics artists and writers and a variety of activities, exhibitors and special attractions. Show hours are Friday, Sept. 12, 3-8 p.m.; Saturday, Sept. 13, 10 a.m.-7 p.m., Sunday, Sept. 14, 11 a.m.-5 p.m.
Marvel Comics and Wizard World, Inc. have revealed the latest edition of its 2014 series of exclusive variant covers of the best Marvel titles with the unveiling of Death of Wolverine #1, drawn by noted artist John Tyler Christopher. VIP attendees at the inaugural Wizard World Richmond Comic Con, September 12-14 at the Greater Richmond Convention Center, will receive a free copy of the limited-edition book at registration. Christopher, who also drew the Amazing Spider-Man #1 variant cover for Atlanta Comic Con in May, is scheduled to be on site at the event to sign copies of Death of Wolverine #1 (autograph fees may apply). Leading professional comic grader CGC will also be on hand to accept books for grading and Signature Series. 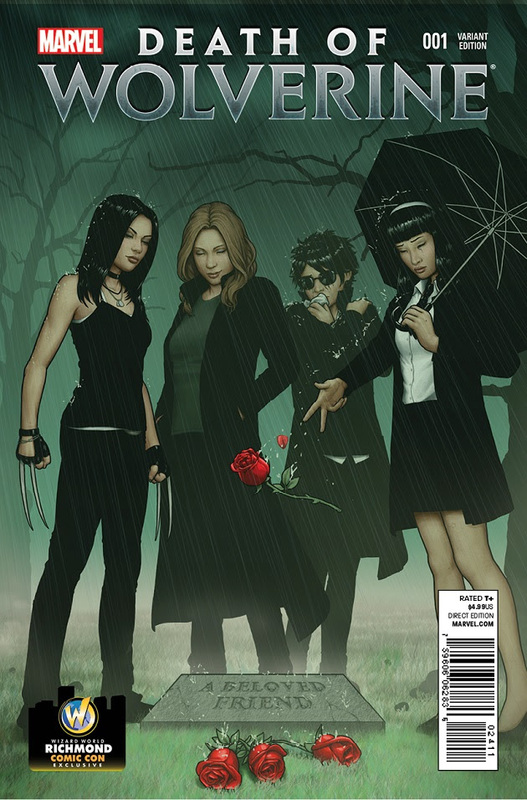 The exclusive version of Death of Wolverine #1 will be limited to 3,000 copies and provided free at registration to all Wizard World Richmond Comic Con VIP attendees, including any celebrity VIP packages. Christopher is an illustrator from Seattle, Wash., currently based out of Atlanta. A member of Studio Revolver, his work has appeared on the covers of Witchblade, as a designer for Star Wars Miniatures, and in the pages of Dungeon & Dragons, a variety of White Wolf publications & Mutants and Masterminds. The beginning of the end is now here…The Death Of Wolverine! Three Months To Die, the loss of Wolverine’s healing factor – all led to this, the single most important X-Men event of the decade. Logan has spent over a century being the best there is at what he does…but even the best fade away eventually. Over the years, Logan has been a warrior, a hero, a renegade, a samurai, a teacher-and so much more. But now, the greatest X-Men hero will play a role he’s never played before in this special weekly event brought to you by industry superstars Charles Soule and Steve McNiven.